When it comes to the mysteries of plant growth, scientists have long seen the dark – yes, the dark. It was Charles Darwin who first reported more than 125 years ago that plant growth spurts often happen at night, not during the day as one might assume. But now, scientists are finally learning more about why that is. A group of researchers reported that they have discovered a set of genes that controls how plants grow based on the time of day, and even how plants can move in response to light and shade. “We now know that the expression of certain genes and hormones at night and just before dawn is important for plant growth,” Oregon State University assistant professor Todd Mockler said. “During the day, the plant focuses on other tasks, such as the photosynthesis that produces its energy. 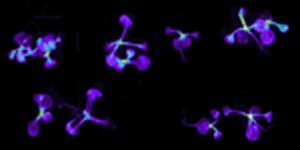 And plants are not only responding to time of day, but also the length of daylight to control such things as flowering time and stem length.” To demonstrate how this works, the scientists attached a glowing enzyme to the genes identified as responsible for rhythmic growth. The picture at right, courtesy of the University of California at San Diego, shows the genes in mustard plant seedlings glowing as they “turn on” just before dawn. Scientists believe that further research into growth and genetics could enable creation of plants with certain desirable characteristics. Researchers from OSU, UCSD, and the Salk Institute for Biological Studies authored the report, which was published in PloS Biology, a professional journal.